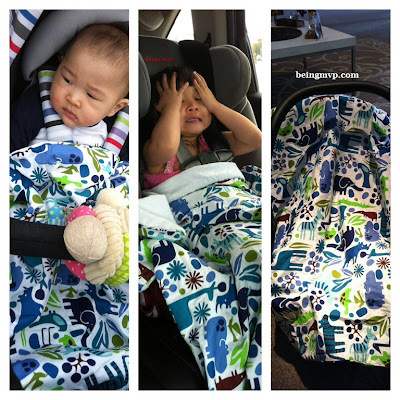 I received the Plush Pad and Stroller Blanket from Ah Goo Baby for review. Ah Goo Baby provides upscale, functional baby products in fun, designer prints. Since Mason was getting a wee bit large for hoisting onto the changing table and has been squirmy, I was excited to try the Plush Pad. It features a memory foam cushion down the center and a water repellent fabric covering so that wetness does not seep in. Mason loves the cushioning and doesn't mind laying there when I change him - thank goodness! I wish I had it when he was just born. It's also super portable as you can just fold in the sides, snap, roll and put elastic around. It's a tad larger than traditional changing pads (with no cushion whatsoever) but it is small enough to put into a diaper bag or even stash an extra in the car. It's great to use as a clean place for Mason to sit and play as well as for tummy time. It's also nice to use as a place for Mason to change in the trunk when we are out and about. I was using the large sun shield previously :) It is much more pleasant with this portable changing pad. I absolutely love that Ah Goo Baby's products all coordinate with amazing prints. The Zoo Frenzy print is much more fab than I expected. The colors are vibrant and the material is of quality - no shortcuts here. 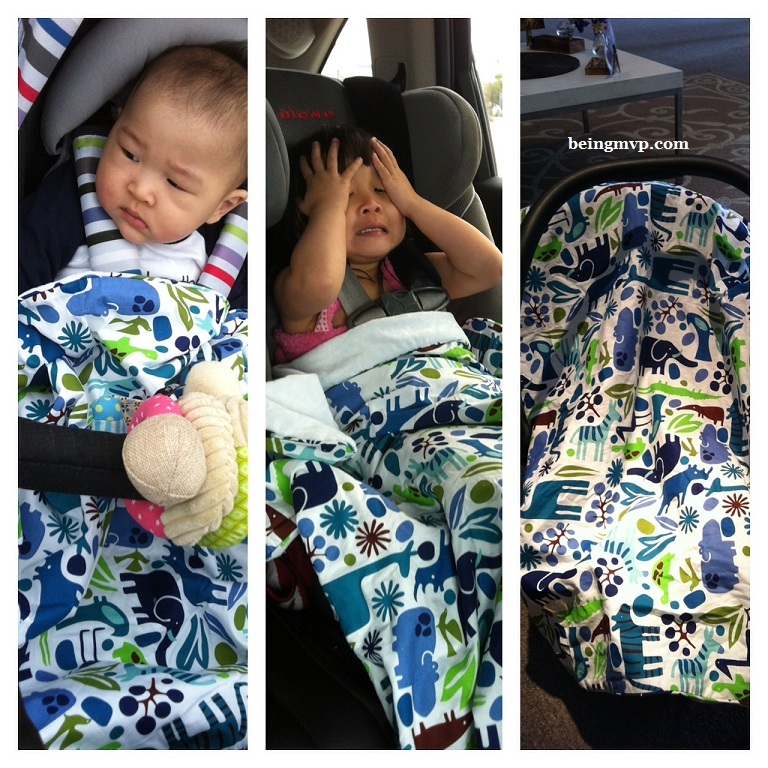 This stroller blanket is a favorite of the kiddos. It's large (41" x 30") as Kenzie states and can be used in the stroller, car seats and more. I love that it is water-repellent which is perfect for laying on the grass when we go to the park or for Kenzie to use to cover up after swim lessons. The back is a plush minky fabric and guess who wants to keep snatching it away from Mason because it's so soft? The blanket also comes with a coordinating bag that you can clip onto the stroller or diaper bag. They have really put thought into how to best incorporate the products into daily parent life. Buy It: You can purchase The Plush Pad for $34.95 and Stroller Blanket for $34.95. Make sure to connect with Ah Goo Baby on Facebook and Twitter! This is so cool! So hard using a traditional blanket and getting it in the stroller without catching it in the wheels. Love the changing pad as well. really neat products here! ive never seen a diaper pad with memory foam! Very nice and can be used for so many things. Love that it can be hooked on your diaper bag, etc. Not a bad price either. What a nice stroller blanket! This would be great on windy/cold days while out running errands with my grandson! i love ah goo baby! i had one of these with my first and it was great the changing pad always people asked about it! love that the blanket is water repellent and also that it has its own carrying case! super awesome! I would have loved having these products when my son was a baby. I love the water repellent cloth and I love the pattern on the material. It is very cheerful. Thanks for sharing. I would have loved to have had this for my son. I'll definitely look into it for my next little one.